Hello Friends, Happy Weekend! Today’s card was inspired by this great sketch over at Mojo Monday! I have been eyeing it for days and even left myself a giant note by my computer as to make sure I didn’t miss out! 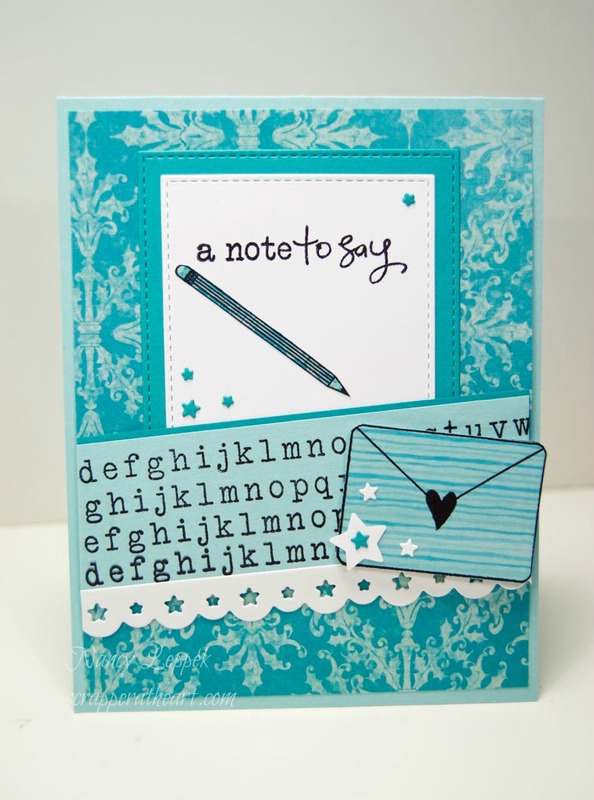 I love Verve’s stamps and have been wanted to use more of this particular stamp set called Take Note then just the sentiments. This set stays out on my creative space because it ALWAYS has what I need, when I nee it! It also has this great strip of ABC’s both in plain text and cursive, and that great envelope, pencil and little heart too. The star border is also from Verve and I speak of this die often as it comes in a set of 3. LOVE IT!!! I have linked both the die and the stamp set up for you! I also used my favorite rectangle stitched dies from MFT and a star paper punch that is as old as dirt. The little stars on my card come from the insides of the star border die. I can’t waste those cute little stars, now can I? The DP paper is something I have had forever…isn’t it pretty? It came in a sample pack years ago and I can’t recall who makes it! The rest is SU. Categories: Cards | Tags: Card making, Cards, rubber stamps, sketch challenge, stamping, Thinking of you, Verve Stamps | Permalink. Love your card and the colors. Blue is my favorite color. 🙂 I have been pondering using this stamp set also. Have a great weekend, my friend. I sure enjoyed spending time with you today. Clever card design and beautiful colors. This is very cool! Love the design and the beautiful colors. Love those stitched dies! Well done! You rocked this set and the sketch, Nancy 🙂 way to flash the Verve 🙂 What joy to hear you got together with JoAnn too – love your heart!! Love this card and the stamps work so well on this. Oh, this is fabulous, Nancy! Love the alphabet on the diagonal. Thanks for playing along with Mojo Monday!